The DAVID Delight by Mind Alive can be used for SAD, ADD, meditation, balance, relaxing, sleep and for just making a good thing better. Easy to use, light weight and portable. The Delight would be a welcome addition for anyone in search of a beneficial and cost-effective mindmachine! The DAVID Delight by Mind Alive can be used for SAD, ADD, meditation, balance, relaxing, sleep and for just making a good thing better. Easy to use, light weight and portable. The Delight would be a welcome addition for anyone in search of a beneficial and cost-effective mind machine! The Delight features larger easy-to-read, easy-to-operate buttons and allows users to select a session very easily. It features five distinct categories of sessions: Energize, Meditate, Brain Brightener, Sleep and Mood Booster, with two selections for each category. Tru-Vu OmniscreenTM Eyesets – Our unique Tru-Vu OmniscreenTM Eyesets were carefully designed to provide you with the most effective and safe light and sound experience. This special patented process allows the Delight to stimulate a different frequency in each hemisphere of the brain. This is essential for mood boosting and mental performance. The Tru-Vu OmniscreenTM Eyesets for the Delight use eight blue-tinted white LEDs mounted over a silver reflector behind a translucent screen. This disperses the light evenly. Our Tru-Vu OmniscreenTM Eyesets are specially designed to allow for the left and right visual fields of each eye to be individually stimulated rather than the entire eye. With the Tru-Vu OmniscreenTM Eyesets, the lights flash into the left visual fields of both eyes, then alternately flashes into the right visual fields of both eyes. This approach allows the ability to stimulate either visual cortex with a frequency different from the other visual cortex. For example, a person who functions strongly from the left brain could have 8 Hz stimulated into the right visual field (and therefore the left brain) to slow down left brain function and have 18 Hz stimulated into the left visual field to increase right brain function. 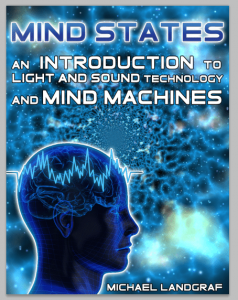 Isochronic Pulsed Tones, Binaural Beats and Monaural Beats – The isochronic pulsed tones are evenly spaced, are of equal pitch and are turned on and off at a specified rate. This is important to enhance the effectiveness of audio entrainment. The monaural beats are similar to the isochronic pulsed tones, but turn on and off more gently and therefore are smoother, fuller beats and are recommended for those who find the pulse tones too stimulating. The binaural beats are two pure tones (one in each ear)and are perceived to have a beat. 10 Preset Sessions – Two sessions in each category: Energize, Meditate, Brain Booster, Sleep and Mood Booster.